I have travelled for many countries before, but there is an special and mythical country that I want to visit before I die... this legendary place is JAPAN. I don't know why, but I always liked this interesting culture. The first time I saw a picture from this country (it is not the one you can see in this post, but you can have an idea) it cautivated me. 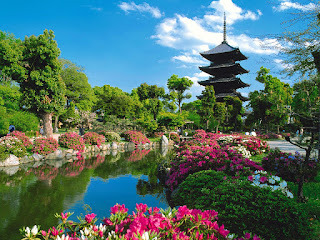 Then I started to investigate about Japan seriously, and everything related to its culture really fascinated me. Later, I went to the Cultural Institute Chilean-Japanese to learn the japanese language. In the end of that year, I was the first student of that course. Well, as you can see, I really want to go to Japan... but what should I do first? I think I'd go just like a tourist... to study in Japan is very expensive and I don't know enough japanese. The first place I'd like to visit is Tokio. This is the capital city of Japan and it is a very interesting place to visit, because it is one of the most technological cities in the world, and at the same time, it has a lot of ancient and historical places. Japan is an intersting country, I know how to play "go", is like the chess of Japan. uuh that is an exotic country especially for their food. I hope that someday you can go. So interesting, Charlie. It sounds like an amazing country.